The monsoon season has ended and the dry, windy, sunlit days of autumn have begun. 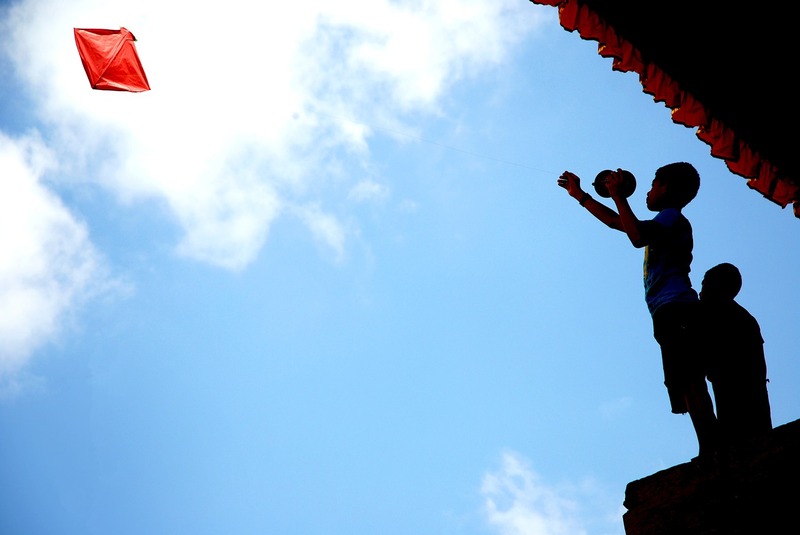 In celebration of Dashain, the sky is dotted with elaborate, colorful kites in all shapes and sizes – as ubiquitous as Christmas trees in living room windows in December and with their own myriad religious and secular symbolism. Watch closely and you may witness a spirited kite fight – young and old fly their kites, awaiting friendly competition. When one cuts the string of another’s kite, bringing it back down to Earth, jubilant cries of “Changa chait! (the kite is cut)” can be heard throughout the streets. Just as popular throughout the season are bamboo swings, or ping in Nepali, that are constructed to represent the best of local culture, tradition and community spirit – and which are, of course, a particularly big hit with the Nepalese children. 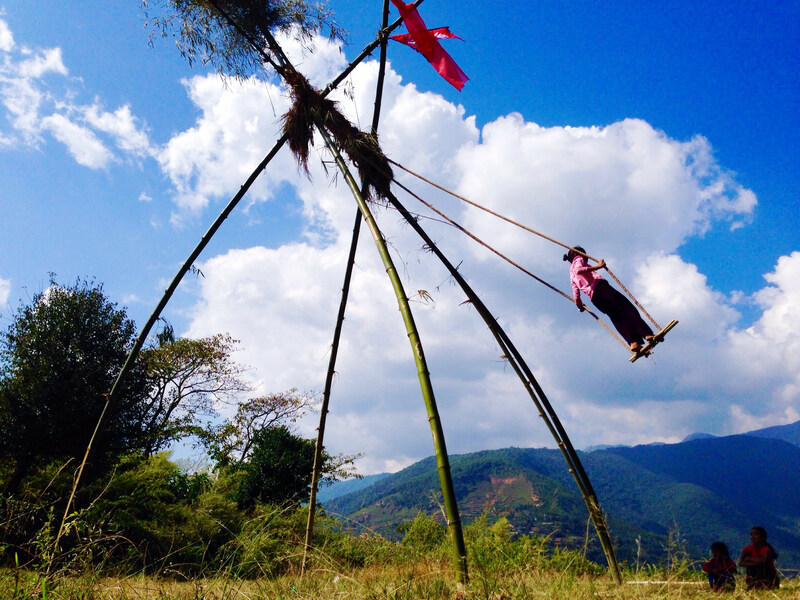 It’s not uncommon to find celebrants of all ages, however, enjoying these detailed swings, which are constructed a week before Ghatasthapana and only taken down after Dashain and Tihar have passed. Some are as high as 20 feet and crafted with tough grasses, bamboo sticks and wood in a traditional manner. Dashain, the 15-day largest and most anticipated Nepalese festival, celebrates the goddess Shakti and her ultimate triumph over evil – the emphasis is on family and community, truth, justice and virtue. 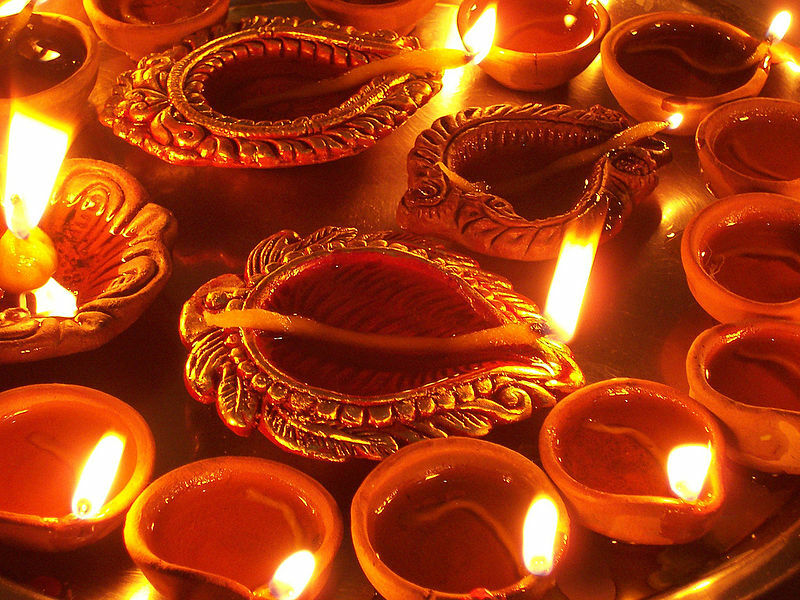 Most offices and business close for the festival, held in September or October and culminating on Purnima, the full moon, and people return home to their villages and families. Each day has symbolic meaning that has resonated for thousands of years, and each day is a bit different than the ones that preceded it. The Taleju temple at Hanuman Dhoka is open to the public on the ninth day, the only time it is open during the year – thousands visit the temple on this day. 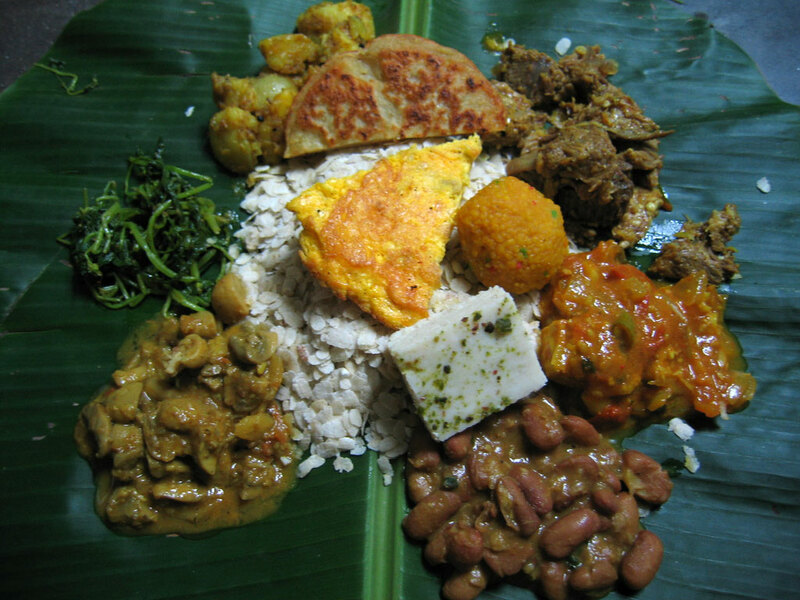 Throughout the festival, there is much feasting, playing of games and buying of new clothing for the family members to wear on the Vijaya Dashami, the victorious tenth day of the festival when the goddess triumphed over the demon – family members mark the day by placing tika, or red rice powder, on each other to give blessings for the year to come. Tihar (sharing many similarities with the Indian festival of lights, Diwali) is celebrated with much grandeur for five days, an ode to both humans and gods, as well as the creatures that share the earth with us, from the crows to the cows to our canine best friends. These special animals are spoiled each day with special care – blessings, yummy treats, worship – and it’s not unusual to see happy doggies strutting around the streets, with garlands hanging around their necks, tails wagging, soaking up all the extra attention. The first day of Tihar, Kaag Tihar, you may notice sweets and dishes placed on the roofs of houses in town – an offering to the crows and ravens. In Hinduism, it is believed that the cawing of these birds symbolizing sadness and grief, so the offerings are meant to eschew death in the people’s homes. Mandala making underway with mum! On the third day of Tihar, Laxmi Puja, people decorate their front porches with a mandala of colorful pigment powders and candles to welcome Lakshmi, the Goddess of Plenty, into their house. 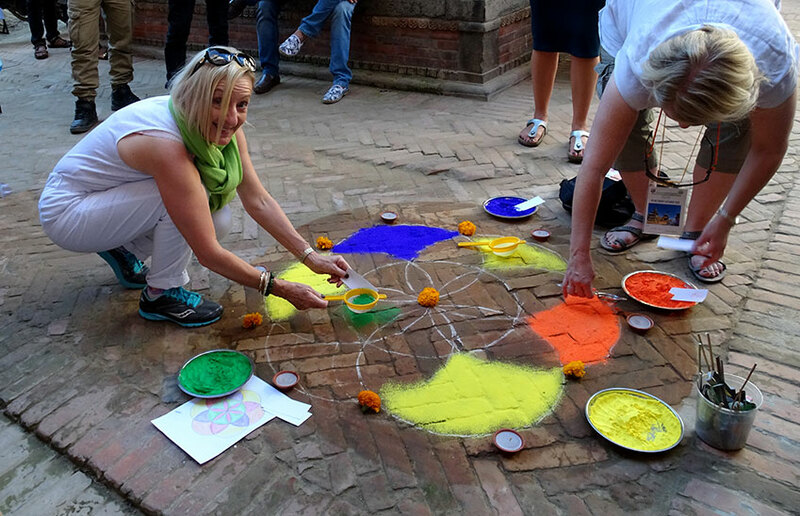 Some use colored rice, dry flour, colored sand and flower petals – it is quite beautiful and elaborate. In the evening, they perform the puja (or prayer) and ceremony. Ange describes her personal interpretation of the principle of Lakshmi to me as “the dignity of labor and the wealth that is brought through honest good work – the rewards of doing good, such as pride, dignity, contentment, harmony in one’s heart and perhaps also financial rewards.” Outside, people light fairy lights and oil lamps and others set off firecrackers – groups of friends and neighbors go from house to house singing traditional songs, not unlike Christmas caroling. This is a joyous time, with much feasting throughout Nepalese households.